ES - Excerpt from '1997 a curious year in Sweden. Excerpt from '1997 a curious year in Sweden. and he will email it to you. all affected by Wifi and other antennas mentioned. population also showed a sudden trend-break in that year. broke the downward trend and started to go upwards. giving a total close to 140 000 long-term sick. has increased from less than 150 in 1997 to 250 in 2003.
employees are twice as sick as small companies. average have degraded by a factor of 2.2 since 1997. So, what happened in 1997? the SCB (http://www.scb.se/) and mentioned before. people in Stockholm follows a similar pattern. Radiation from handsets or from towers? power from mobile phones in the different counties. possible consequences of the results presented here. Re: Excerpt from '1997 a curious year in Sweden. What is the title of the paper so I can order it? moves of your orchestra to assist with your situation. > What is the title of the paper so I can order it? Thank you for that info and the website. Very cool articles. But, very accurate information, that I did not know about. It was in Sweden, and exactly around 1997 that I started getting some serious health problems, that, at that time I could not find the reason for. 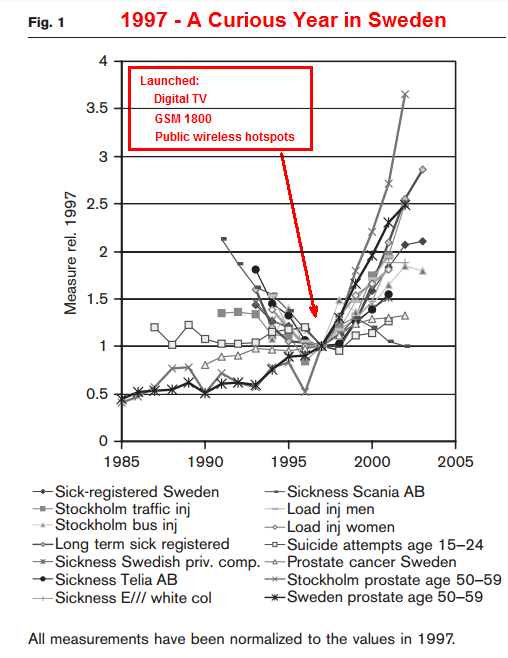 I was living in Stockholm at the time, and if you look at the image, the values for Stockholm are much higher than the average, for cancer for instance. I remember clearly that the worst years for me were 98 and 99. After that I started trying to go to other places once in a while.